If you struggle with managing overwhelming emotions on your grief journey, the following image may help. Do you ever remember seeing an old-style wooden bucket with thin vertical slats of wood? How much water would this bucket hold if several of the slats were shorter than the others? This bucket will only hold as much water as its shortest slat. Recently I've been thinking about this image as I reflect on health and well-being. We are whole people. If one area of our life is "shorter" or causing more stress than others, it will limit the amount of "water" our lives can hold. Think about these different areas of your life: family and friends, work and finances, recreation, exercise, healthy eating, spirituality, education and learning, and adventure. Which one area is the "shortest slat" or has the most stress? In grief you may feel like many of them are too short, and it is too overwhelming to work at fixing that. I would invite you to pick one and make a manageable goal to improve it over the next few days. Perhaps you have not been eating well. Buy your favorite fruit. Eat it slowly, savor it. Celebrate the good choice you made. Or perhaps you know that writing would enhance your spirituality. Make a goal to write for five minutes today. And then practice being grateful for the grace to write for those five minutes. I have found the best way to manage overwhelming emotions is to make a few small doable goals. Carry them out and celebrate each step forward. All day long I knew I needed to sit with a photo and find a centered place to be. All day long I found myself striving to get one more thing done. Finally I reached the end of determined pursuit of one more task--it came in the few minutes while the soup simmered for supper. I sat down at the computer and opened my photo editor. This photo of the gazebo must have been the photo I worked on last. I said to myself, "I really need a place like that." It was at this time my five-year-old walked in and declared he was starving and counldn't wait another minute to eat. Ah, space to be, so needed, so hard to find. In this photo I see a white gazebo with sunlight shining into it. 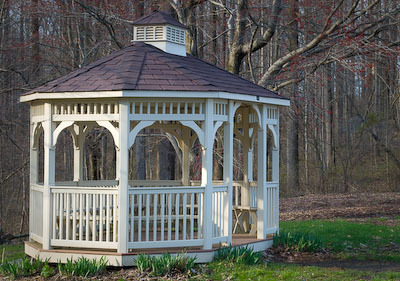 I see leafless trees in the background, with new greens of spring surrounding the gazebo. I feel invited and drawn to be still, to rest, to know that the demands of life do not dictate how I will live. I want to go there, lay down on a bench and be warmed by the sun. While the play of the sun on the gazebo draws my attention, the barren trees won't let me leave them unnoticed. 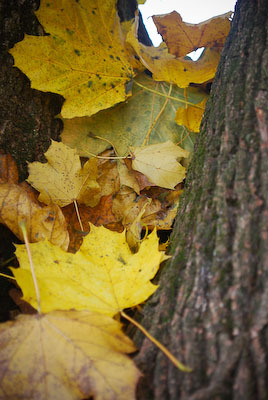 They remind me that there is a place for all seasons. They remind me that they have been through a winter. I know that there are sunlit gazebos even in the winters of our lives. I am reminded that within a day where all I see is barrenness, there are places to lay and be warmed by the sun. What longing, pain, hopes, emotions does this photo touch in you? If you would like to write about it, choose one emotion and give it your full attention. A recent addition to the Journey-through-Grief website is an article written by a friend of my who has recently walked through a journey with cancer. There is a real sense of grief in these kinds of journeys where normal life is taken away and for a time everything focuses on health. Click here to link to this page. If you are local to Pennsylvania, you may be interested in a series of retreats that a friend and I are offering. This retreat provides space for participants to explore their spiritual journey through scrapbooking, photography, and other visual arts. Feel free to contact me anytime, if you think of anything that would be a helpful addition to the site. Also feel free to pass this newsletter on to anyone you might know who would find it helpful.